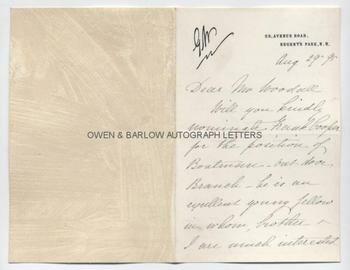 DAME GENEVIEVE WARD Autograph Letter Signed. American born British soprano singer and actress. ALS. 3pp. 22 Avenue Road, Regent's Park, N.W. August 29th 1895. To [William] Woodall. Together with a fine contemporary portrait photograph. "Will you kindly nominate Frank Cooper for the position of Boatman - outdoor Branch - he is an excellent young fellow in whom brother and I are much interested. His mother, a most worthy woman, takes charge of our house in Shanklin. I know you are always ready to do a kind action, & that is my excuse for troubling you. With many thanks anticipatamente." 12mo. Approx 6 x 4 inches. Mounting residue to blank verso of last leaf, else fine. The photograph is a fine 19th century albumin silver print measuring approx 5.75 x 4 inches (excluding mount). 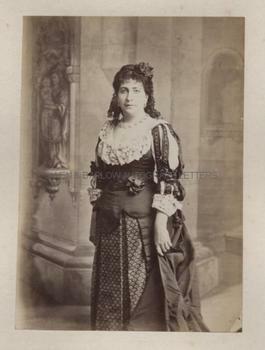 It shows Genevieve Ward three-quarter length in theatrical costume. It is laid down on card from album leaf with mounting damage to verso but the photograph is in fine condition. 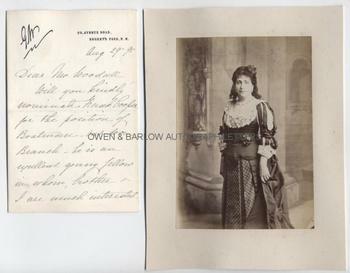 Genevieve Ward had a spectacular but short career as a soprano singer, rising to the very top of her profession. She was a favourite of Rossini and sang in Naples, Milan, Paris, London and New York. She was forced to retire when, following her last performance in La Traviata in in 1862, the strain on her voice led to untreatable vocal difficulties. After a spell as a singing teacher, Genevieve Ward turned her attention to dramatic acting. She enjoyed a long career as an acclaimed actress in England and her wide circle of literary and theatrical friends included Henry Irving, Oscar Wilde, Longfellow, Tennyson, Mark Twain and Bram Stoker. 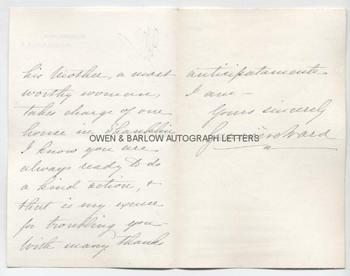 Genevieve Ward was Bram Stoker's first known romantic attachment and she remained his close friend until his death in 1912. Both the letter and photograph are from a 19th century collection made by the radical Liberal M.P., William Woodall.